Tightening the family food budget means relying on some unsung heroes of the kitchen. Specifically, ingredients that have been seen as the poor relations of their flashier cousins: chicken thighs and legs. While the U.S. has been eating chicken breasts at an amazing rate in the past 10 years, consumers haven't figured out the other part of that equation. To get the breasts off a chicken, two thighs and two legs must come off, too. Ergo, the "scraps" from that walking chicken breast -- the thighs and legs -- are sold at a much, much lower cost than the coveted breast meat. Check out your poultry section at the grocery. Breasts are far more expensive than thighs and legs, which are far more expensive than buying a whole chicken and cutting it up yourself at home (that's another story, though). Many recipes are better when cooking with thighs and legs. The bones add flavor. The darker meat is less apt to dry out. And did we mention that they're way cheaper? Several years ago, a friend and I took a class (maybe two?) at the New Orleans School of Cooking in the French Quarter. It was fun, and the school sent along some recipes this week that use the other parts of the chicken. Even those who have never had the privilege of visiting New Orleans likely know – and have enjoyed – two of the region’s most celebrated dishes: gumbo and jambalaya. These classic New Orleans dishes are steeped in history, a culmination of a variety of cultures that converged in Louisiana beginning in the 18th century. While gumbo and jambalaya are distinguishable in their cultural origin – one is Creole, the other Cajun – both are thick, one-pot meals meant to serve a crowd. 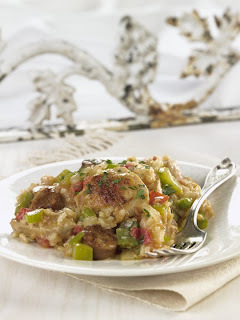 Gumbo and jambalaya make use of the classic Louisiana cuisine “holy trinity” – a combination of chopped onions, green peppers and celery – that forms the backbone of flavor that distinguishes many traditional New Orleans dishes. The meals are often thickened with a roux, a combination of a fat and flour cooked to a varying degree of brownness, depending on the dish. However, Cajun and Creole dishes may also be thickened with file powder, made from ground sassafras leaves, or okra, a vegetable of African origin used throughout the South. Gumbo, a stew or soup made with chicken and/or shellfish, is often classified as a Creole dish, a distinctive cuisine developed in New Orleans with European and African roots. The French cooking techniques are strongest in Creole cooking, but the flavors of the dishes are often an indiscernible mix of cultural influences from Africa and Native and Latin America. Creole food stands out for its rich sauces, use of local herbs, tomatoes and other indigenous ingredients. The cuisine also uses butter and cream – giving it the reputation of being more elegant and served in City restaurants and hotels. By contrast, jambalaya is often classified as Cajun (while there is a Creole-style version that makes use of tomatoes and offered as an option in this version). Cajun cuisine is often distinguished by its robust and hearty one-pot meals that are often served over rice. Cajun food is a combination of French and Southern cuisines and is a more “down-home” or “country-style” of cooking. Cajuns are the descendents of French-speaking inhabitants who came to Louisiana from Acadia – what we now call Nova Scotia. These immigrants absorbed the culture of Native and African Americans combining them with their own – creating a distinctive Cajun culture. Jambalaya is, essentially, a New World version of paella. A combination of chicken parts is browned in oil with sausage. Then the classic “holy trinity” of vegetables, also used to make gumbo and many other New Orleans dishes, is sautéed until tender and full of flavor. Unlike gumbo, rice and liquid are added directly to the pot and cooked much like Spanish paella. The dish is finished with chopped tomatoes and green onions, if desired. Warm oil in a large shallow pan or Dutch oven. Add chicken and brown over medium heat. Add sausage to pot and sauté with chicken. Remove both from pot and reserve. In same pan, heat oil for roux. Add flour and cook over medium low heat until flour is desired color – the darker the roux, the darker the sauce. Add onions, celery, and green pepper. Add garlic to the mixture; stir continuously. When vegetables reach desired tenderness, about 7-8 minutes, return chicken and sausage to pot and cook with vegetables, continuing to stir frequently. Gradually stir in liquid and bring to a boil. Reduce heat to simmer and cook for an hour or more. Season with Cajun seasoning, adding 1 teaspoon at a time to taste. Add salt and pepper to taste. Approximately 10 minutes before serving, add green onions. 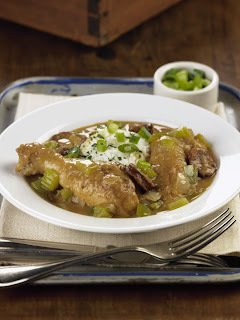 Serve gumbo over rice or without rice, accompanied by French bread. In large Dutch oven, warm oil. Add chicken and sauté over medium high heat until browned. Add sausage to pot; sauté with chicken. Remove both from pot. Add onions, celery, green pepper and garlic; sauté until tender, about 9-10 minutes. If making red jambalaya, add paprika. Return chicken and sausage to pot. Add stock (or stock and tomato juice, or Bloody Mary mix if making red jambalaya) and Cajun seasoning and bring to a boil. Add rice and return to boil. Cover and reduce heat to simmer. Cook 25 minutes. After 10 minutes of cooking, remove cover and quickly turn rice from top to bottom completely. Continue cooking for remaining time. Season with salt and pepper to taste. Add green onions and chopped tomatoes, if desired. ***For Red Jambalaya (see instructions in recipe body): add 1 TBSP paprika and substitute tomato juice, a good Bloody Mary mix, or vegetable juice for ½ of stock.